Measuring forty-five by forty-five inches–form following subject or subject suggesting form–Frank Tenney Johnson’s 1937 masterwork, Smoke of a .45, is a cinematic classic, canvas kin to a head-on, headlong action shot straight out of Stagecoach or The Searchers, the kind you’d have seen in bijou movie theaters across the country then. You would have heard the screams as mount and man seemed to ride right over the audience. And that’s who we are–we viewers of this painting–an audience, engaging the rider in this nick of time moment as he seems to be veering to his left. In truth, the rider doesn’t notice us. He’s busy, with his eye on what–or who?–he’s chasing and firing at. It’s a story for you to finish. Is he a lawman after a renegade, a robber, a rustler? Is he himself an outlaw out to settle a score? Is he a cowboy trying to turn the herd from danger? You write it. You film it in your mind. …But when we look beyond the action of the scene–the painterly quality and careful composition of the painting is immediately striking. 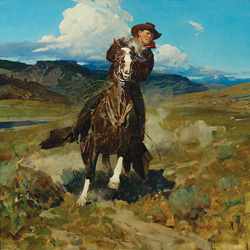 The high thunderhead behind the rider evokes the idea of thunder that echoes in the pounding of the horse’s hooves and in the puffs of dust that trail behind. This cloud does double duty, casting shadows that provide a brooding backdrop for the otherwise sunlit scene. 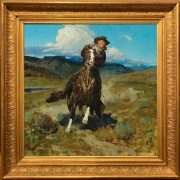 Johnson builds the background with easy, broad brushstrokes; the horse glistens with sweat and races with a wide, wild eye. This may well be the denouement of a long, True Grit chase with a trail that has led from the far side of that far off peak at right. Born in Iowa in 1874, Frank Tenney Johnson saw the last of the prairie schooners heading West. After the death of Frank’s mother, the family moved to Milwaukee. There, on a class field trip to the Layton Art Museum, young Frank determined to make a life in art. Johnson studied under Panoramist Richard Lorenz, whose enormous circular paintings of biblical and battle scenes were precursors of cinema. Lorenz, who had traveled and painted in the West, fired Johnson’s imagination with his canvases and tales. Johnson and his new bride, Vinnie, went to New York first, where he studied and enjoyed success in the burgeoning advertising industry. Johnson’s sketches at the Bronx Zoo earned him a contract with Winchester rifles. His ads, in turn, caught the attention of the editors of Field & Stream, who offered to sponsor a trip to the West which he would repay with illustrations. Johnson’s art alone couldn’t support him, so he cowboyed in Colorado to earn a living, and saw some of the last “beef roundups” in American history, an experience that would prove invaluable to his art. Eventually, he and Vinnie settled in Southern California, in the very heart of the nascent movie business, where he painted murals in movie theaters, sold his works to the new moguls, and starred in more than one early silent cowboy picture. In December 1939, Frank and Vinnie were visiting their friends, the Callahans. Frank greeted Mrs. Callahan with a kiss. What neither of them knew was that Mrs. Callahan was coming down with spinal meningitis. Within days, she had died. By the end of the year, Frank Tenney Johnson had passed into the story of the Art of the American West.